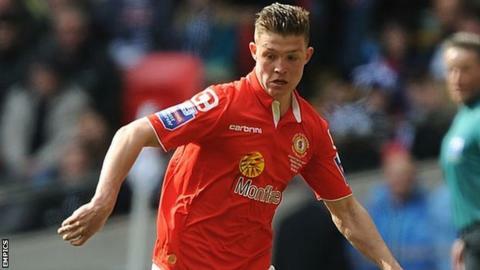 Crewe Alexandra manager Steve Davis says Max Clayton's impending move to Championship side Bolton Wanderers can help to get his career going again. BBC Radio Stoke reports that League One club Crewe are set to receive a fee of around £300,000 from the proposed sale of the 20-year-old, who is an England Under-20 international. "If it happens then it will be good for Max," Davis told BBC Radio Stoke. "He still has a lot of potential and needs to get his career going again." Crewe academy product Clayton's future has been uncertain for the past 18 months, having already been linked with moves elsewhere when he broke his ankle last November, since when he has not featured in the first team. Although fit to return at the end of last season as Crewe battled against relegation, Davis opted not to use him. And, after it became clear to the club that Clayton was going to move on having turned down the offer of a three-year contract extension, he has spent four months out in the wilderness, during which time his agent has taken him on trial to Sunderland, Wolves, Bolton and Danish club FC Midtjylland. The final decision still rests with Clayton and his agent, but Crewe have agreed a compensation deal for the striker with Bolton. "Nothing has been finalised yet," added Davis. "Any decision rests with Max and his agent but we have been as helpful as we can to him to come to a conclusion. "He has had a tough couple of years with the all the expectation on him and then the injury he suffered last year. "He didn't have the impact he would have wanted in League One and we were disappointed that he didn't sign his contract with us because the club did everything they could to try and keep him." The Crewe boss continued: "Max needs to get his career up and running again but, as a club, we also had to receive decent compensation for all the hard work the likes of Dario Gradi and the coaches have done here bringing him through the academy and into the professional game."